Whether it’s a bad case of back pain or something as serious as degenerative disc disease, an inversion table is something you shouldn’t be without. 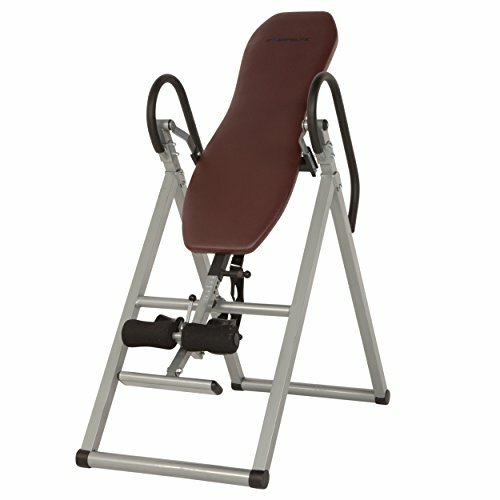 Recently, I dove into the market of fitness inversion tables, looking for the very best design for both fitness and wellness. And after spending days on thorough research, the Innova ITX9600 Heavy Duty Inversion Table came out on top as the ultimate design. Featuring a highly adjustable, robust construction that can hold up to 300 pounds of weight, the ITX9600 doesn’t play around when it comes to providing real relief for anyone and everyone. Plus the fact that the model is the most affordable of the top four performers, the design is guaranteed to give you the best value for your money. A few runners-up I found almost made the cut and definitely gave the Innova ITX9600 a run for its money. But more on those designs later. First, I want to give you the nitty gritty details that put the ITX9600 a cut above the rest. An inversion table is an investment. 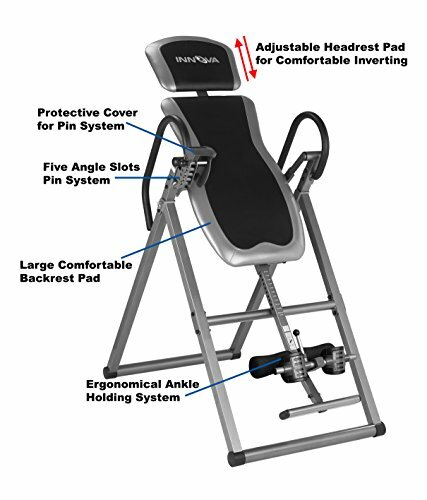 Allowing you to address different types of body pain and giving you a whole new way to exercise, you should make sure your fitness inversion table can sustain your weight safely no matter how many times you use it. One of the reasons why the Innova ITX9600 outdid its competition is the fact that it’s built to be extra heavy duty. The design features a stainless steel frame that can carry a weight of up to 300 pounds. Users up to 6 feet 6 inches tall can comfortably use the table with ease and utmost safety. Hinges and connections between pieces are expertly reinforced, so even with repeated use, the table doesn’t get all rickety and hazardous. The backrest pad has also been reinforced to provide greater resistance to wear and tear. With ample padding and a wide surface area, the backrest pad can comfortably accommodate a range of user sizes, guaranteeing safety and stability even when fully inverted. 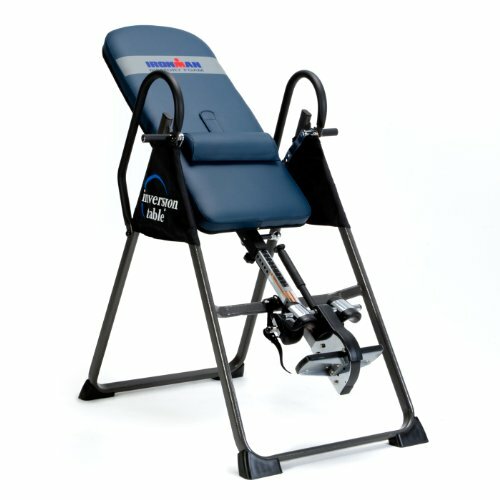 Lots of other fitness inversion tables use a simple system that simply turns you over without regard for your center of gravity. But the ITX9600 goes the extra mile to give you a more comfortable, more natural experience. The design’s True Balance System is the first of its kind – providing 3 adjustable key points to help you achieve optimal use. 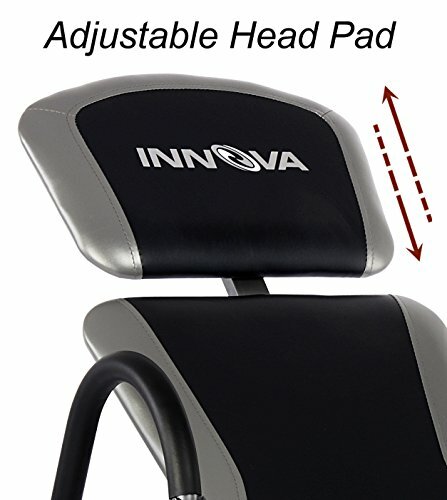 The adjustable headrest pad moves to accommodate taller users, allowing a larger clearance around its border and the backrest. The height of the table can also be adjusted using the height adjustment tube. This moves the backrest along the length of the table, letting you position it to accommodate your specific weight distribution, height, and weight. Finally, users also have the option to adjust the position of the foot rest and ankle holding system to make room for a range of different leg lengths. By adjusting these three settings to meet your specific body size and shape, you can achieve a much more comfortable and natural positioning that maximizes the benefits of the table. Most inversion tables you’ll find move through a range of angle settings without presets. That is, users will have to determine the most comfortable angle for their preference, and will have to adjust the table manually. Now, searching through such a wide range of angles can be tedious work, and not to mention dangerous if you’re just starting out. So the ITX9600 comes with a unique Five Angle Pin Slot System to make adjustments easier and safer. The system is similar to what you’d see on gym equipment, allowing you to secure the proper angle for utmost safety and consistent inversions with each use. The system allows users to choose from a range of angles with increments of 15 degrees between each. So if you’re a first time user, this feature can make it especially easy to graduate inversion. 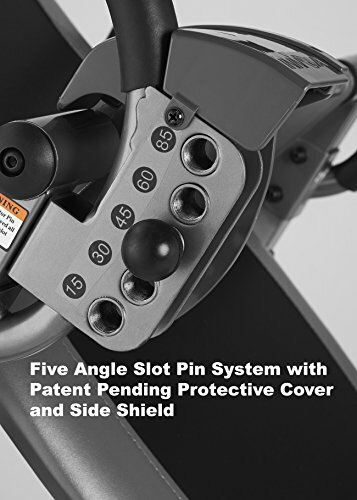 Personally, I think the Five Angle Pin Slot System also makes the contraption a whole lot safer compared to other designs available. The pin locking system keeps the angle secure and stable and prevents the table from moving beyond your chosen setting. Heavy duty construction means your inversion table won’t become flimsy or unsafe over time. Ample padding inside the back and head rests make it an excellent choice for comfort. Five Angle Pin Slot System lets you choose the proper inversion position to meet your specific preferences with safety and consistency. True Balance System takes your center of gravity into consideration, allowing you to micromanage all the different parts of the table to suit your body. Compact, foldable design can be easily stored away when not in use. Comes at a much more affordable price than other choices. Not the easiest table to assemble. I searched far and wide to make sure I wasn’t missing out on any other fitness inversion tables that could have bumped the ITX9600 out of the top spot. While these three other designs didn’t quite make first place, they do offer some pretty impressive functionality that could make them the best choice if the ITX9600 just didn’t quite meet your standards. 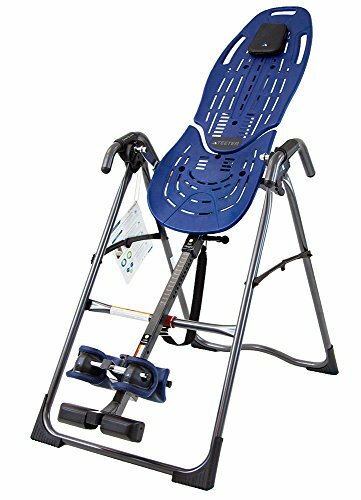 Dubbed the inversion table with the highest weight capacity, the IRONMAN Gravity 4000 can sustain a weight of up to 350 pounds. This foldable, waterproof, well-padded table has some of the most comfortable ankle cushions I’ve seen, which definitely makes it one of the front-runners in the market especially because a lot of other manufacturers seem to struggle with ankle cuff designs. The reason why I couldn’t rank the Gravity 4000 any higher is the fact that it’s pretty high off the ground. So shorter users might have a hard time getting in the table without assistance. I also feel like the folding arms can be a bit of a hazard, especially because there isn’t anything holding them down when the table is in the downward, locked position. Well-built design can stand up against daily wear and tear. Memory foam padding is exceptionally comfortable and easy on the back. Fairly easy and straightforward assembly lets you get the table up and ready in minutes. Super comfortable ankle cuffs let you stay inverted for longer without pain or unease. Design is slightly too high off the ground, making it difficult for smaller users to secure themselves without assistance. Folding arms lack the proper locking mechanism to maintain their position when the table is positioned downwards. What gives the Teeter EP-560 an edge over other choices is its unique backrest design. Made from high density plastic, the backrest features a number of holes and grips. These give you greater room to move and stretch to achieve optimal relief. The design is also pretty lightweight, thanks to the backrest design which does away with all the padding and heavy steel frames. Then again, it’s this same backrest that bumps the EP-560 a few notches below the top spot. Without the padding, the stiff plastic can be uncomfortable on the skin. What’s more, the backrest’s holes and patterns can dig into the skin and cause irritation after a while. So the concept of the backrest could either be a hit or miss, depending on the user. Extra-long Stretch Max handles let you achieve different positions for greater joint decompression. Lighweight design is easy to assemble and store. Wrap-around ankle cuffs are secure and comfortable. Comes with free app access with that’s developed to help you make the most of the EP-560. The lack of any padding makes the backrest uncomfortable. It’s not exactly the sturdiest frame you’re likely to find. Want more details? Read our Teeter EP-560 full review. Boasting a comfort foam backrest, the Exerpeutic Inversion Table could possibly be one of the most comfortable designs you’ll find. The table sustains an industry-standard 300 pounds, and features reinforced construction for improved safety and longevity. 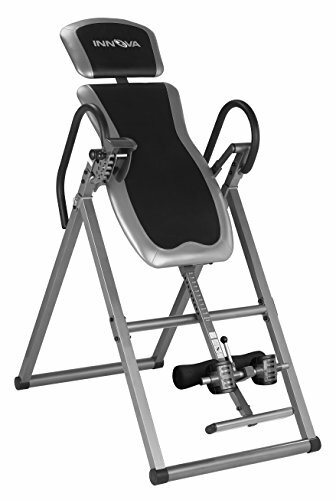 On the overall, the design is pretty basic and it does what a fitness inversion table should. My only problem with it is that it might be too plain. I feel like it’s lacking any sort of special features to set it apart as a better choice. Plus, it comes with a pretty steep price tag considering what it brings to the table. This becomes double apparent when compared to other, more versatile choices on the market. Ultra-comfortable backrest uses comfort foam material and provides substantial support for extended hours of use. Reinforced steel frame makes the table perform well against wear, tear, and frequent use. Rolling cushions along the calves make the table particularly comfortable for the legs. For the price, it doesn’t really offer anything special or different. All things considered, the Innova ITX9600 Inversion Table just really comes out on top as the best choice. With its ultra-heavy duty construction, intuitive True Balance System, and its Five Angle Pin Slot System, the design makes it possible for you to achieve comfort and relief that’s specifically tailored to suit your standards. Then again, the choices from IRONMAN, Teeter, and Exerpeutic aren’t all that bad. Sure, they come with their own flaws and downsides. But they might still make a suitable choice if you’ve got specific preferences that the ITX9600 just wasn’t able to meet.